I am reading the copy of Art of the Start I won in the inBubbleWrap draw on St. Patty’s Day, and I am struck by the philosophical meshing between Guy’s 10/20/30 rule and Cliff Altkinson’s Beyond Bullets approach to Powerpoint. In my work environement, I am occasionally called upon to produce, and sit through, Powerpoint presentations. I find myself trying desperately to use the Beyond Bullets approach: maximum message with minimum text. Adding the 10/20/30 rule gives me another tool to not only re-examine how I produce presentations, but to critique those that I sit through. I may ask Guy if it is possible to buy and distribute the chapter containing 10/20/30 to all the people in my company. Worth a shot, as I can’t afford 60 copies of the book. Art of the Start is worth it, just for 10/20/30. Just upgraded to WordPress 2.02. Let me know if any unusual weirdness ensues. Earlier today, I wrote about my issues with a conflict between Check Point and Netscreen VPN software. Well, I figured out how to make them work together. I had the answer in my hands the whole time. Check Point software binds to the network interfaces on your machine. Once you remove this binding, Check Point refuses to work at all, allowing you to use the Netscreen software. Re-enabling this binding then allows you to use the Check Point software again. 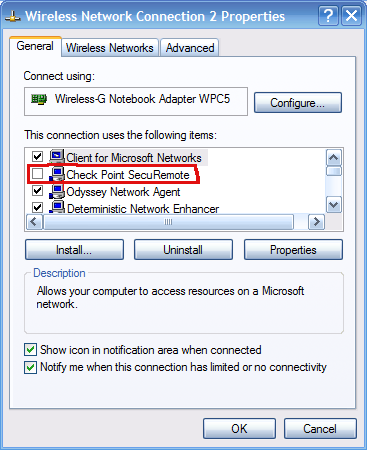 To do this, select your primary network interface, and uncheck the Check Point SecuRemote binding, as indicated below. If you are one of the two people in the world who needs this, I hope this helps. Rick Segal is in China at the moment, and is writing about his experience. Next up, you run your bags through an X-ray as part of customs. I did this and the customs guy decided to open my camera bag, ignoring my computer bag and luggage. He takes my camera out (Nikon D200) studies it and says, in perfect english, â€œI have a Nikon digital and was thinking about upgrading, howâ€™s this camera?â€ We proceed to have a ten minute conversation about Nikon digital cameras and at the end of this conversation, he smiles, and says â€œWelcome to China, enjoy your stay.â€ Thatâ€™s two â€œwelcomesâ€ and 100% positive interaction with the government officials so far. And the question is: How can a Chinese customs official afford an $1100 camera? As part of the work I am doing for a client, I needed to install the Check Point VPN software. So far so good. Until I want to try and connect to my company’s VPN, which uses Netscreen. It didn’t work. Seems that the Check Point software does something that I both agree with and find frustrating given the nature of what I need to do right now. Check Point binds itself to all of your computer’s interfaces and refuses to allow other VPN software to work. Makes sense, after all, why are you trying to establish another tunnel on the same computer. Then I got the bright idea to try and install it on another computer in the house and VNC into that box to do the work. Well, Check Point blocks inbound VNC connections, effectively becoming an uber firewall. Strike three. I am not a happy boy right now. This project was not supposed to be that difficult. Over the next few weeks, I will be hitting the road, bringing the Crazy Canuck roadshow to a city somewhere near you. As a result, I am looking for some geek dinners in Phoenix (May 8) and London (May 13-16). I know that there are a few bloggers out there who read this blog who love to get out of the house and eat occasionally. Drop me a comment if you have some spare time in your calendar any of those nights. As many of you know, I inherited an old, very well-used T-Mobile Treo 600 a couple of weeks ago. Well, I have become acutely aware of people who have them, much like suddenly noticing pregnant women when your wife is pregnant. Today, I am on-site at a large client in the Philadelphia area, and the office is wall-to-wall Treos — 600s, 650s, and 700s. It’s just astounding to see them all. The comment from the client is that the entire company runs on Treos. Many organizations have migrated to a seamless wireless/laptop/tethered workflow, to the point where it really doesn’t matter where you are, you can get the job done. You can now get the e-mail out and talk to the client as effectively from the car or the airport gate or cube or home office. WIth IM, Skype/Yahoo Voice, work just happens. With me, I can work in spurts between 06:00 and 23:00, spreading the traditional work day into manageable useful chunks, done when appropriate, when I am at my best intellectual effectiveness. The paranthetical workday is irrelevant to me. The structured office environment is irrelevant to me. The other side of the coin is that it is important to realize just how mobile we have become, just as it is becoming more and more expensive to be mobile. Will $70, $80, $100 barrels of oil make the wireless revolution the only economical way to do business? Is having more Treos/Blackberries/Windows Mobile devices per square foot a good thing? Or is it the only thing that will work until we wean ourselves from oil? Stefan of the Help me become a switcher blog has raised nearly $1000 toward getting himself a Powerbook. Obviously I am just not motivated enough, cause I have been begging for donations to get one for over a year; so far I can afford a new Apple sticker for my Moleskine. Stefan, I applaud your gumption…and success! The flights have been booked. We are going home to Canada for 3 weeks from June 26 to July 17. United turns out to be worth something — I got two of the four tickets to Seattle on Mileage Plus points, which cut the cost of the trip almost in half. Plus $400 for the dog. Yes, Miss Wiggles is joining us on this 3-week adventure to the West Coast — mainly BC and Alberta. Should be interesting. I haven’t been back to Victoria since September 2003, and Samantha (who just returned from there) said that it has changed a lot. But travel with children — and pets — is always interesting. 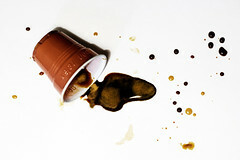 Mmmmmmmâ€¦your coffee tastes like weasel vomit! This sounds gross, but read Rick Segal’s post to understand that the world is indeed stranger than my psychotic mind can dream up. And yes, I would love some Weasel Coffee, if only for the adventure! And you can add some Civet Coffee as well! All of this from edible.com, purveyors of epicurean delights guaranteed to curl the toes of any of your more squeamish co-workers.